Porosity is a hot issue when it comes to natural hair, as it is the way that many of us came to learn and understand the needs of our highly textured hair. To be completely honest, I never delved too much into porosity as a transitioner. When you've got heat damage, worrying about porosity is borderline pointless because well, the cuticles are damaged and any porosity reading you glean from the damaged hair will be inaccurate (and you're going to be cutting away at that hair anyway). Needless to say, I didn't start concerning myself with porosity until long after I had chopped my damage off, and was working with completely natural hair. Getting hair color back in October (wow that was a long time ago lol) only heightened my awareness and experience with porosity changes in natural hair. The truth is, there are tons of resources available online for ladies with low porosity hair (and thank you all for chiming in via comments to help educate me on lo-po hair issues), so I think we've pretty much got that covered. I'd like share some information for the ladies who's levels are similar to mine -- on the high end of medium porosity (or heck, even high porosity). We have needs too! Medium/high porosity natural hair is characterized by the ability to absorb penetrating ingredients quite easily. Water and water-based products don't just cascade off of or sit on top of the hair, they are "soaked in" because cuticles may be lifted in some areas (damaged), and less tightly compacted in others. This same cuticle structure lends itself to medium/high porosity hair not as easily retaining moisture, and feeling dried out in the days following wash day. The lack of internal hydration found in medium/high porosity natural hair can lead to brittleness/decreased elasticity, increased split ends, breakage, and of course, not meeting your length retention goals. If gone unchecked over time, you may end up feeling like your hair "isn't growing", or have reached a length plateau -- and your hair's medium/high porosity may be to blame. Don't tell me you didn't see this one coming! Therapy Session is like, deep conditioning bae. That pretty pink jar never disappoints. Not never. However, there is a method to the madness -- a reason I keep coming back. There are 3 ingredients that make Therapy Session like gold for me: panthenol, Keravis protein, and dimethicone (yes, dimethicone). Panthenol (aka Pro-Vitamin B5) is a humectant and hydration boosting ingredient. It significantly enhances water uptake into the hair, which in turn helps ward off dehydration, breakage, and splitting. Keravis protein, which I talk about at length here, is able to penetrate the cortex of the hair, helping to build strength from within while coating and conditioning the hair to protect the surface. Lastly, dimethicone acts as a conditioning agent, helping to smooth the cuticle cracks on the surface of the hair while performing lightweight "sealing" to aid in moisture retention. This 3 ingredient cocktail (with jojoba oil to boot) helps to increase the internal moisture balance of medium/high porosity hair while helping to make it stronger, smoother, and resist breakage. A note on dimethicone (and silicones in general): A number of you reading this may be on the Curly Girl journey, avoiding silicones at all costs. I'm always a fan of "do you boo", but with one caveat. Be educated and properly informed before taking up a particular mantra. If you have a moral aversion to siliciones, or they make your scalp break out, then I understand and that's okay. But some people hate siliciones because their favorite YouTuber hates silicones, and that's not okay. Liking or disliking something just because someone said so is not the way to go about life. Do your own research, educate yourself, and develop and informed opinion. I happen to like siliciones, as long as the price point reflects the silicione content (i.e. I'm not paying $40 for a 2oz "miracle" oil that's cylopentasiloxane and dimethicone based). Silicones on the whole, are conditioning ingredients. Some rinse off with water, others evaporate, and still others (like dimethione) remain on the hair and require washing to remove. That's no different than what you must do to your hair after using oils and butters. Even when using oils and butters, you have to clarify every once in a while to remove buildup. I know this is getting long-winded, but my point here is to stop vilifying an ingredient based on faulty information (or no information at all). I happen to like silicones, because without them, most of my color-treated hair would have gone down my shower drain by now. So yeah, there's that. I've written on the wonders of this deep conditioner before, and what keeps me coming back to it is the ingredient profile. It most certainly ain't the smell (oh, sweet play-doh, how I loathe thee). Much like Eva NYC Therapy Session Hair Mask, the Shea Moisture JBCO Treatment Masque contains panthenol and Keravis Protein to hydrate and strengthen the hair.Not to mention the tons of oils and butters like coconut, shea, mango, olive, avocado, and castor that help soften and improve elasticity. I love ApHogee's Curlific Texture Treatment for a few different reasons. One, it's geared toward meeting the needs of textured hair. Two, it's pH-balanced (as are all their products). Three, it contains panthenol and hydrolyzed quinoa protein. Are you beginning to notice a pattern here? Hydration and strength are instrumental to the health of medium/high porosity natural hair. We've already discussed the function of panthenol, but hydrolyzed quinoa is just as (if not more) awesome. Quinoa protein is similar in makeup to animal protein, because of the amino acid profile. These aminos penetrate and nourish hair, providing smoothness, softness, hydration, sheen, and form a protective barrier against environmental stresses around the hair. The added benefit of pH balancing helps smooth and lay the cuticle flat, aiding in increased shine and moisture retention. This unassuming white tube flies under many naturalistas radars, and I can only assume it's because I don't see it in very many stores. Honestly, I only see it at Whole Foods and Sprouts. But don't let that deter you! This deep conditioner is a great alternative for ladies with medium/high porosity hair that may be protein sensitive. It will also please the Curly Girl crowd. It contains Vitamin E, sunflower seed oil, and tons of organic extracts like nettle, chamomile, and soybean to help strengthen the hair, improve elasticity, ciment the cuticle layer (seal in moisture), and reverse the signs of aging and damage to the hair. Another pick for the protein sensitive crowd, or for those who don't want to overload on protein. I don't use protein-y deep conditioners every wash day, for fear of overdoing it. tgin Triple Moisture Replenishing Conditioner is my go-to protein-free conditioner. It works incredibly well on my medium/high porosity color-treated natural hair. The formula did chance to coincide with the Target launch, but it works just as well if not better than the old one. The new formula contains panthenol (I think you know the benefits by now), as well as championed oils and butters like coconut, shea, cupuacu, argan, and sweet almond. In addition to softening the hair and adding shine, these oils and butters help ciment (fill in/seal) spaces between the cuticle shingles along the hair shaft, aiding in moisture retention and improved elasticity. Try incorporating cold water rinses. The proteins in our hair are sensitive to temperature changes. Without making it too complicated, warmer water opens the cuticle more, while cold water helps it to flatten. To help with moisture retention, rinse your deep conditioner out with water that is as cold as you can manage -- somewhere between moderately cool and cold. Humectants! Because medium/high porosity hair loses moisture easily, feeding your strands with leave-ins and styling products that contain aloe, panthenol, castor oil, agave, sugar cane, and glycerin will help keep the hair from drying out. For the love of God, please don't do a hair-in-glass-of-water porosity test. Just....don't. 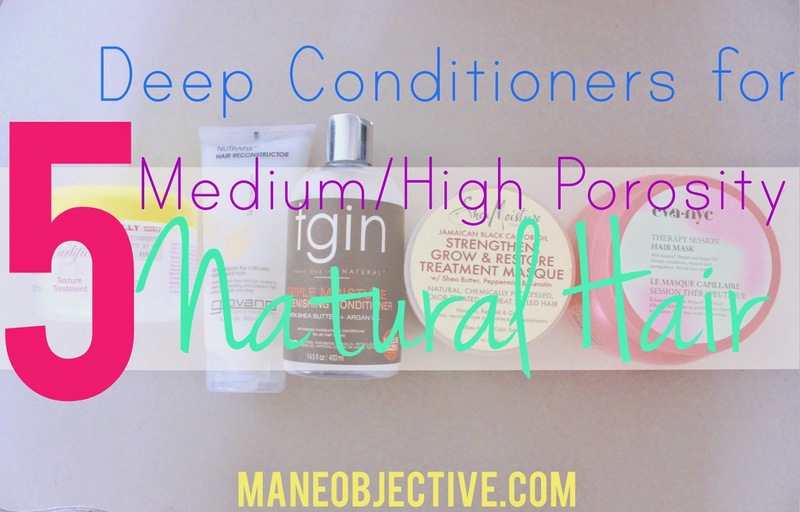 What deep conditioners do you use on your medium/high porosity hair? Girl, I am doing the tootsie roll when I saw this post pop up in my email. This article came right on time! I'm going to start transitioning from heat damage and I was going crazy on Monday trying to figure my hair porosity. I came down to the conclusion that I won't know until I get rid of the heat damage and see my real natural hair! It's like you wrote this for me because you mentioned everything I need to know! By the way: I totally agree with you regarding silicones...it's not that serious! 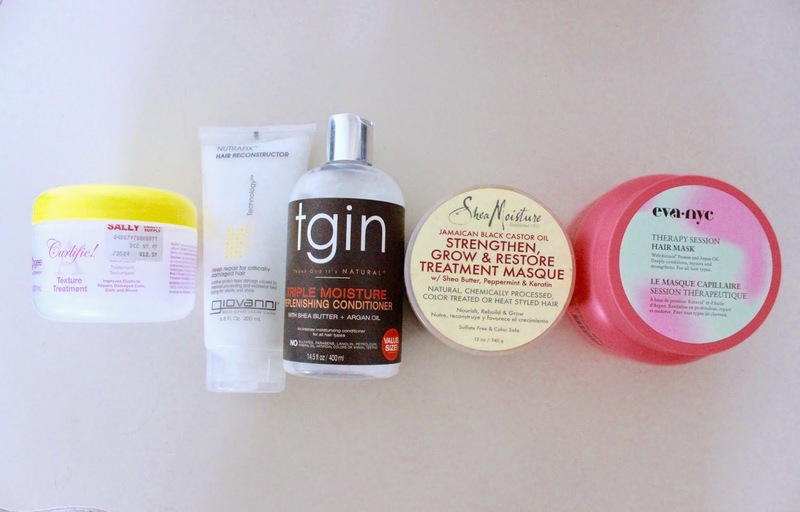 Oh, and if you ever get your hands on these, I would like to see your reviews on: Curl Junkie Rehab and Macadamia Natural Oil Deep Repair Masque. Good post Christina. I'm curious how you alternate between co-washing and using cones. Do wait to use cones before your next poo or you use them even when you plan to follow up with a co-wash? Thanks for defending cones. They are conditioning. Number one ingredient, these days in skin care products, is xane or a cone. Even my face spritz meant to keep my makeup through humidity has cone as number one ingredient, and I swear it leaves my skin silky smooth. They are a better alternative to our choices of the 80s and 90 - petroleum products! Talk about yuck! Im always open to a better way then cones, but ill take cones over the other stuff. :o :o What about Karmin? When I started my natural hair journey 3 years ago, I remember coming across an article that a hairstylist wrote about silicones He said that women need to stop stressing over silicones. He said that silicones actually help other ingredients absorb into the hair and help keeps the hair moisturized. I was never the one to avoid silicones. I just bought Moroccan Oil reconstructor, very pricey ($43). After reading this article, I'm returning it and purchasing the Aphogee Curlific and Giovanni Nutrafix and rotate them every 6 months. I forgot Giovanni has a protein treatment; I love the leave-in conditioner. I use Aphogee 2 minute protein treatment, but I've been using it for 3 years now and kinda getting tired of it. Would love to see how the Aphogee Curlific works on my hair. Great article, and very interesting products.I will definitely try Shea Moisture JBCO Treatment Masque and hope to see good result. Thanks for sharing.